When I had a baby, I was obsessed with finding the right bottle. 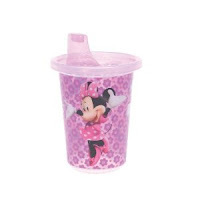 Now that I have a to ddler, I must find the perfect toddler cup. As of now, we're still using the BornFree Trainer Cups. Hila is extremely attached to them, and while I'd love for her to graduate away from these very bottle-like cups, I can't bear to take them away from her. 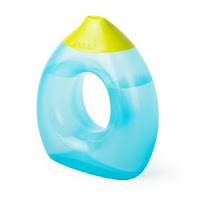 I'm hoping that if I can find other sippy cup that she likes, she'll slowly create new, less intense attachments to other cups, making BornFree weaning and the transition to a real cup easier. 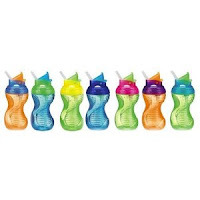 Next I will try the Boon Fluid - No Spill Toddler Cup. Maybe it's time to just stop wasting money on fancy cups and teach her to drink from a cup. 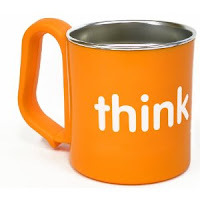 Perhaps an attractive mug, like the Thinkbaby Kid Mug would be a nice next step. I know whenever I'm drinking from a mug, she wants one. Did you try the Doidy cup? My 13 month old is managing to drink from it with minimal spills, except when he decides to wave it about or wash his hands in it! wow--never heard of or seen that cup. it is adorable! Looks like it's only available in the U.K. Will look around for it. Thanks!